Summary: Discusses why a Rhino system might need to retry multiple times to obtain a license from a Zoo server. We have a large number of licenses, over 180, of Rhino and all of those licenses are managed by a single Zoo server. We have noticed that the Zoo is sometimes a little slow to granting licenses when requests are made. 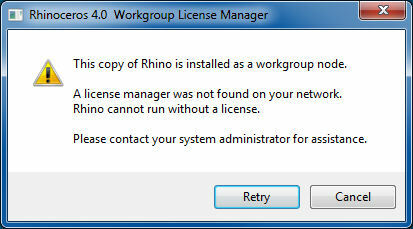 That is, our user base often has to keep “retrying” to get a Rhino licenses before one is finally delivered. It is as if the Zoo times out before it manages to think about delivering a license. Do you have any technical notes or pointers that I can refer to help solve this? There are a couple of reasons why you might get this message. Rhino's message never made it to the Zoo due to a configuration issue or a firewall. The Zoo was too busy to respond in the timeout period. The Zoo's response never make it back to Rhino due to a firewall. Reasons 1 and 3 are the most common reasons for this message. When a workstation gets this message, open up the Zoo's Log file (Tools → View Log File), scroll to the end of the file, and look for incoming messages from that workstation. If you don’t' see an entry around the time of the license request, then make sure the Rhino workstation is properly configured (Zoo registry key, etc.) and that it's firewall is properly configured. You can find configuration details in the Zoo help file or on the Zoo Installation and Configuration page. Reason 2 can occur on large, busy networks, overloaded servers running the Zoo, or on Zoo servers host a large number of licenses. One way to ease the load on the Zoo is to increase the period it waits to recover unused licenses. 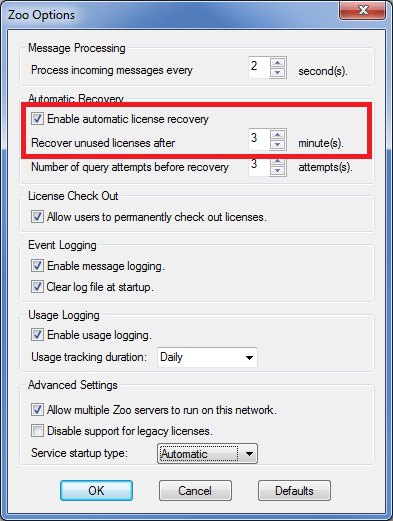 The Zoo's Recover unused licenses parameter defaults to 3 minutes, which is adequate for most Zoo servers. But for busy Zoo servers, you can increase this value to 12 or even 15 minutes to decrease the load on the Zoo. After changing the value, please close and restart the Zoo.